President of Georgia Mikheil Saakashvili strongly opposed the decision of the government to sell Super Puma helicopters, purchased from EUROCOPTER, in France. Saakashvili said that the Defense Ministry was trying to negotiate with a St. Petersburg businessmen. "We purchased two powerful Super Puma helicopters in France and we had an opportunity to purchase two more. But now I have learned that the Defense Ministry intends to sell these helicopters abroad. 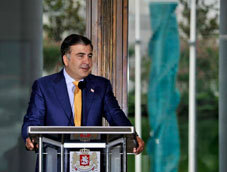 It turns out that they cannot maintain the helicopters," Saakashvili said earlier this week. Fearing that the government would negotiate sales with foreign businessmen and finally sell the helicopters, Saakashvili immediately issued a decree banning the sale of Super Puma helicopters owned by the state. Head of the President's Administration, Andro Barnovi, informed the media about the president’s decision on September 9th and said that the presence of helicopters is of vital importance for the conduct of both the military and rescue operations, especially for a mountainous country like Georgia. “With the help of French President Nicolas Sarkozy we were given four Super Puma helicopters, but because of the complexity of procedures it was possible to deliver only two of them. The new government could have taken measures for the delivery of the other two, but it preferred to sell the already delivered helicopters to individuals. 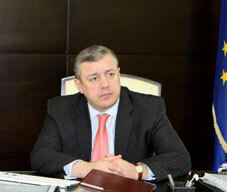 This we consider wrong," Barnovi said. According to him, the president believes that selling two French-produced helicopters will weaken the Georgian armed forces. The Ministry of Economy of Georgia released a special statement on September 10th and confirmed that the government was definitely going to sell the helicopters. However, the ministry says the president and his administration provided inaccurate information. The statement says that the Super Puma helicopters are not assigned to the Ministry of Defense, as the president had stated. Therefore the helicopters, as state property, are at the Ministry of Economy’s disposal. Also, the ministry says that the president cannot issue a decree to ban selling the helicopters, as Georgian legislation does not provide him with this power. According to the statement, the French company provided Georgia with two civil helicopters, not military, as the president had stated earlier. Moreover, the ministry said one of the helicopters belongs to the VIP class and the interior had been designed especially for President Saakashvili. The Ministry found it very hard to search for a potential customer for the helicopters. “The price the government has paid for the helicopters is very high, it is very difficult to find a potential customer,” the ministry stated. The government has paid 55 Million EUR on two helicopters and none of the dealers on the international market agree to pay the same amount. Minister of Economy Giorgi Kvirikashvili said that his institution is not going to offer a discount on the helicopters and harm the budget, so the government will try to find a use of them inside the country.